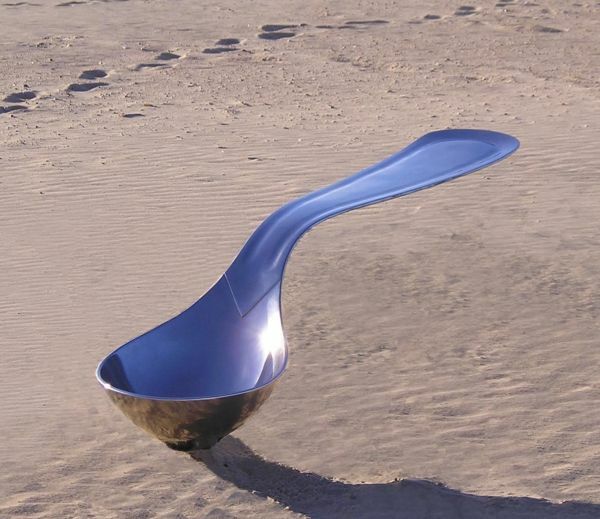 As I was surfing around the World Wide Web, I came across these interesting sculptures of spoons. 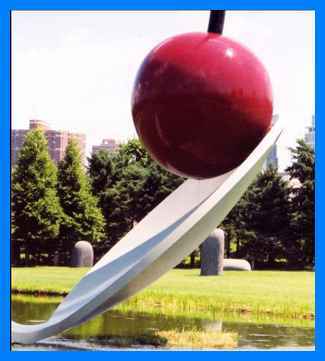 I have no idea as to where this interesting sculpture is located - -email me if you know. 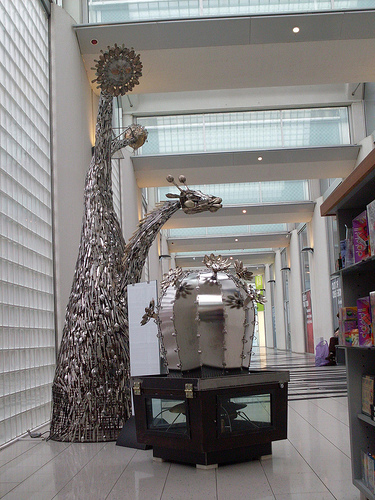 Rather surreal sculpture made from old Sheffield-made household steel, in the Millenium Gallery, Sheffield. 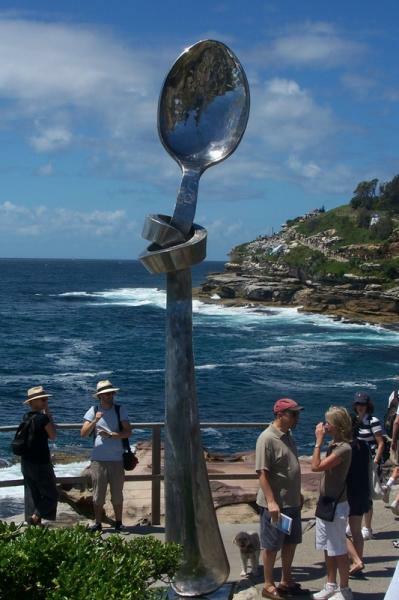 This knife, fork and spoon sculpture is alongside the Northgate flight of locks. 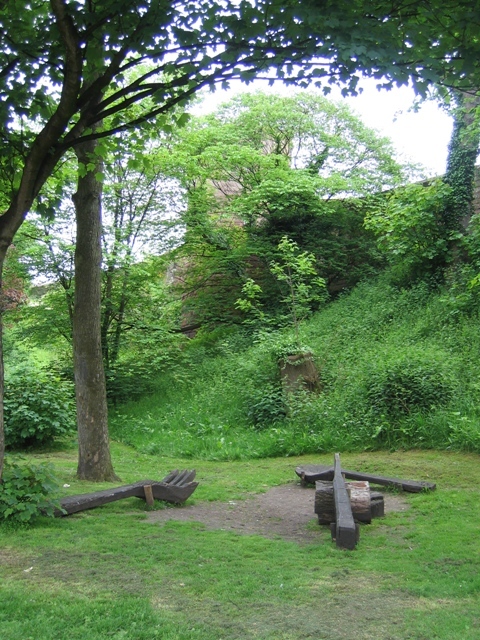 The city walls run along the bank to the right and Pemberton's Parlour is hidden by the tree in the centre. 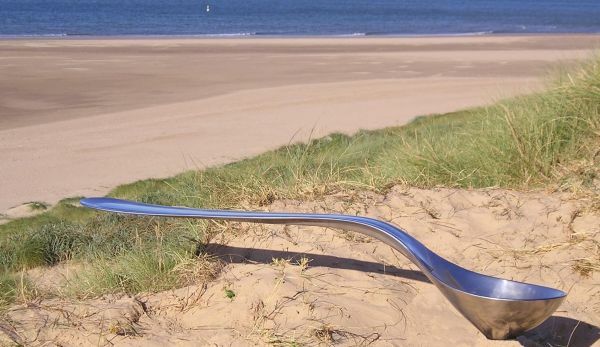 English Sculptor, Mark Reed, has produced 4 large stainless steel spoons. 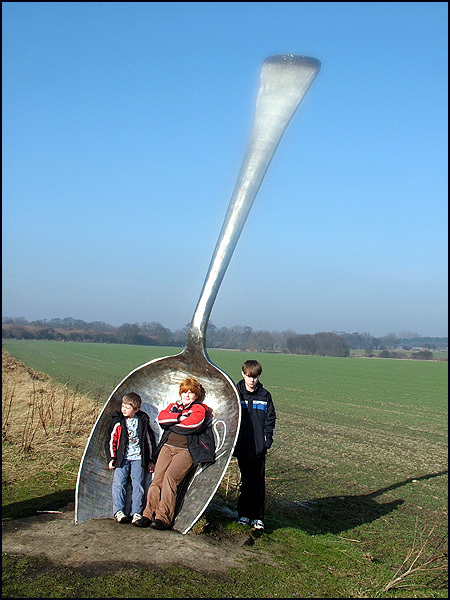 One of his young sons is seen sitting on the spoon to give you perspective. These pictures are copyrighted by Mark Reed and reproduced here with his approval. 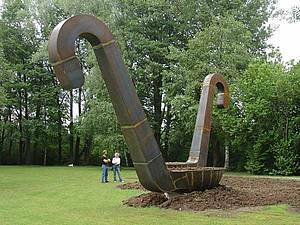 "I really love your website and came across your images of large spoons whilst looking on the internet, I just wanted to let you know that my husband Mark Reed, is a sculptor and also has a love of spoons! 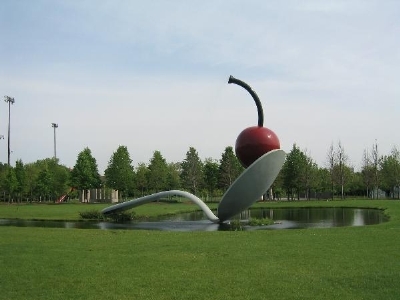 He made the Spoon Bench in 2004, when we had our first little boy, while he was teaching our sons to eat, the humble spoon became highly significant, as a means of giving nourishment and independence. 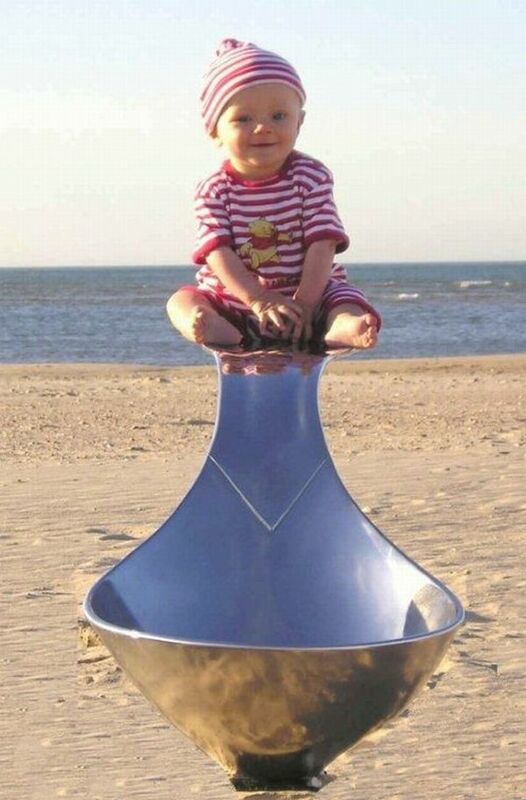 He saw how, in a baby’s hands, an adult spoon is enormous and out of place and this observation led to the stainless steel spoon bench, unfamiliar in it’s size and place, and seemingly levitating. The Spoon Bench can take up to 4 people sitting relaxing on the handle, the ladle section can be a birdbath or we’ve made it as a dogs bowl and in the image it holds a dollop of Oscar Reed! We have also made one as a diving board for a swimming pool. Last year we made one as a memorial for a cherished patient (who had a particular penchant for spoons) of a nursing home in Hertfordshire in England but as a sculpture standing upright and with a message and name/ date inscribed upon the back of the handle, as if a makers mark on a silver or stainless steel spoon. "